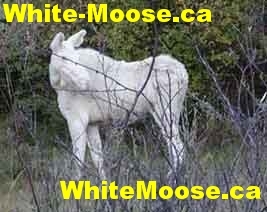 Q- Are the White Moose shown in the pictures on this site Albino? A- NO. They are not albino. As such, they do not exhibit the negative health effects associated with albino's. Q- Is this a new species? A- From a scientific perspective, it would seem that these animals are not a new species, but merely exhibit a rare color variation. However, I've yet to come across a scientist to definitely answer the question. It seems that these animals are, in all respects, analogous to the spirit bears of British Columbia, which exhibit the same white color phase. Another example may be the white tiger, which in all respects is a normal tiger, with the exception of its color phase. Q- Why are there not more White Moose around? A- There is really no definitive scientific answer to this question. One answer may be that because the color phase is so rare to see (estimated at 1 in 10 million), moose carrying the gene to have white baby moose haven't had a good opportunity to find and breed with each other. Another answer may be that white moose are less adapt for survival, and natural selection has eliminated them over time. The counter argument to this answer would be that northern Ontario is covered in snow for approximately 6 months of every year. Snow is white. These moose are white. Although the MNR has conducted winter aerial surveys in the area for over 50 years, they have yet to spot a white moose. Coincidence? Q- What should I do if I have information about the topics raised on this site?